Sugar reduction: What about the drinks not included in the Soft Drinks Industry Levy? Children are currently consuming more than double the recommended daily intake of sugar. Consuming too much sugar is among the main causes of too many children leaving primary school overweight or obese and suffering with tooth decay. 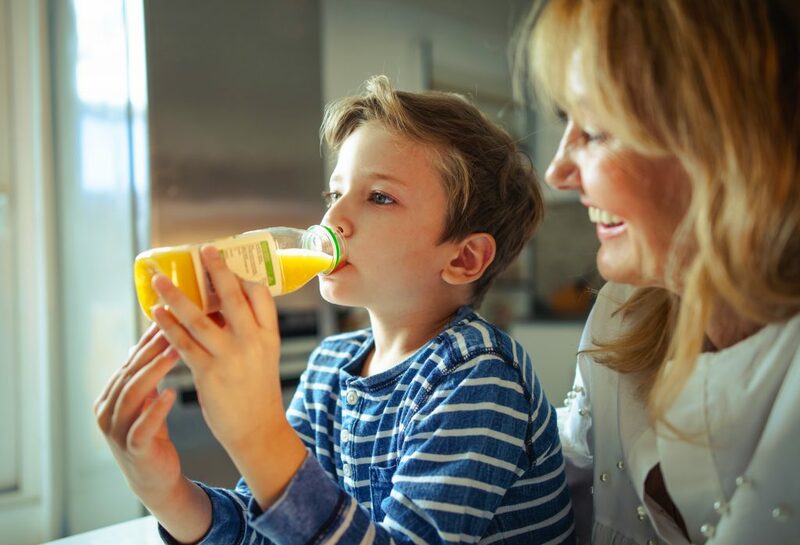 Whilst much of the focus on reducing sugar is on food products and soft drinks, we must not underestimate the contribution milk based drinks and juices make to children’s sugar intake. Juices are a healthier option, particularly as they count as one of your 5 A Day. However, when consumed in large quantities, which is often the case, they contribute a large amount to our sugar intake; accounting for around 10% of the sugar consumed by 4- to 18-year-olds daily from juice alone. These drinks are all around us – in our homes, cafés, restaurants, corner shops and fast food chains. Larger portion sizes of products likely to be consumed in a single occasion can lead to us consuming more than we need. For example, as a result of large portion sizes, we can easily consume 500ml of juice at one time when the recommended portion to be consumed in one go is 150ml per day. Juice and milk based drinks are also often included in meal deals, which may mean we choose them over other drinks as they seem like ‘more value for money’ than an equally offered bottle of water. This is why the drinks industry plays an important role in helping to reduce the amount of sugar we buy and consume. Milk based drinks and juices are incorporated into PHE’s Sugar Reduction Programme as part of the government’s childhood obesity plan. We have now published guidelines for the drinks industry to reduce the amount of sugar in these drinks, which include milkshakes, sweetened coffees, hot chocolates, juices and smoothies that are pre-packaged drinks as well as those sold at cafes, restaurants and fast food chains. reduce sugar in milk (and milk substitutes, such as soya and almond) based drinks by 20% and cap products likely to be consumed in a single occasion to 300 calories. Our advice to the public to limit juice or smoothies to a total of 150ml per day and to only consume them with meals remains unchanged. When consumed in this quantity it counts as a maximum of one portion of our 5 A Day. How is this different to the Soft Drinks Industry Levy? 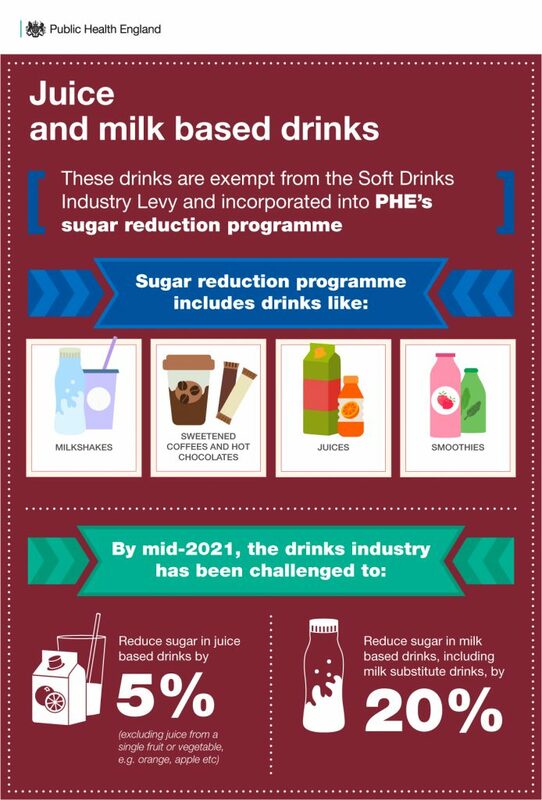 The drinks that fall under these new guidelines are those exempt from the Soft Drinks Industry Levy (SDIL) but due to their contribution to our sugar intakes, bringing them into PHE’s Sugar Reduction Programme was essential. The SDIL is a key component of the government’s Childhood Obesity Plan, first announced in 2016 and brought into law in April 2018. It encourages the drinks industry to remove added sugar, promote diet drinks, and reduce portion sizes for high sugar drinks. Progress on sugar reduction for milk based drinks under this programme will be taken into consideration when Treasury reviews their exemption in 2020. 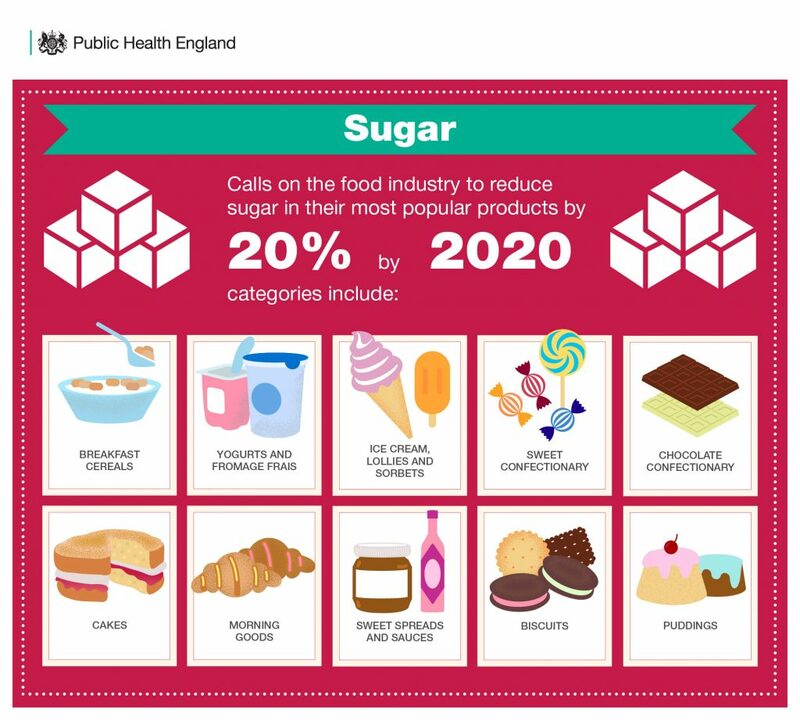 PHE’s Sugar Reduction Programme aims to reduce the amount of sugar children consume through everyday foods that contribute to their intake – specifically a 20% reduction by 2020. Milk based drinks and juices are expected to meet the new guidelines as part of this wider programme, and their inclusion as additional categories is detailed in the Childhood Obesity Plan. The new guidelines are published alongside the Sugar Reduction Programme report which provides an update on the progress made in its first year. The next step in the programme involves further engagement to develop the metrics for future progress reports. The first progress report for milk based drinks and juices will be published in mid-2020. Read our sugar reduction overview blog for more details on the programme. Instead of ruining what we eat and drink why don't you try educating children in schools. As an adult I am quite able to make my own mind up to what is healthy to eat and drink.